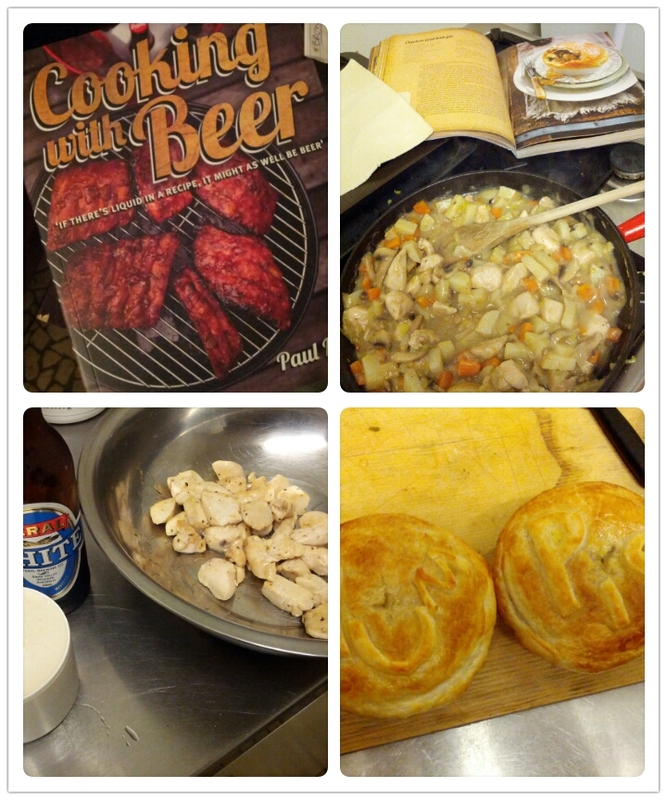 Pies and beers! Yes, I know, it’s not exactly a revolutionary concept but I’m not talking about questionable meat encased in stale pastry and wrapped in microwave safe plastic. Though this isn’t to say you won’t catch me occasionally devouring a servo pie on a road trip up to Perth. However, in this instance I’m talking about a twist on the old favourite. 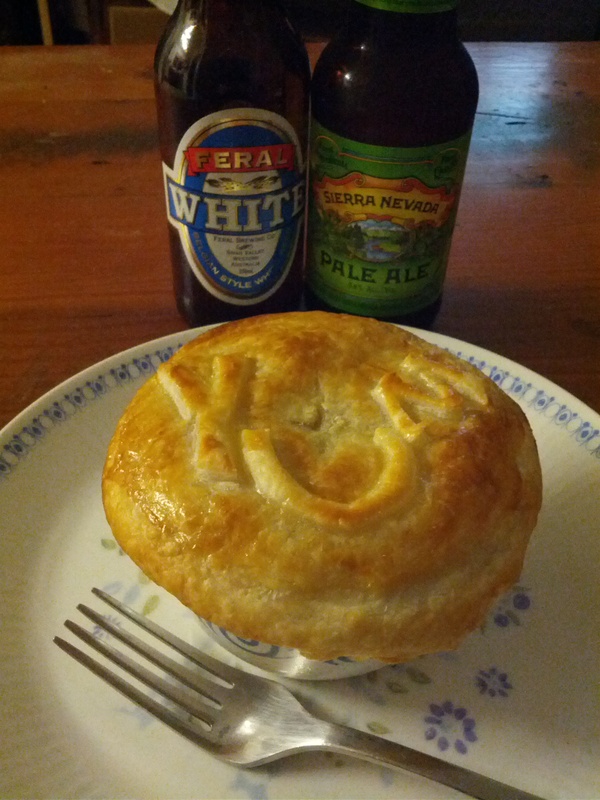 Continuing my current cook book love affair with ‘Cooking with Beer’ by Paul Mercurio, I decided to try my hand at the Chicken & Leek Pie. The recipe calls for a Saison however after an unsuccessful hunt around it would appear this particular beer style isn’t around these parts … not yet anyway as I hear the Eagle Bay Brewing have a Saison lined up for their next limited release. In a search that took me from bottle shop to bottle shop like a lost alcoholic, I stood in the Dan Murphy’s liquor store and wondered what would be the best replacement. I looked at Belgian ales and English ales and then realised there was something a little closer to home that would be ideal – Feral White. Feral White (4.6% abv) is brewed true to the Belgian Witbier style with a 50/50 ratio of barley and wheat and also uses an imported Belgian yeast strain. Coriander and orange peel are added during the boil and it’s appearance is cloudy and unfiltered. I doubt there would be any beer lovers in WA who aren’t familiar with Feral Brewing and their first and most popular beer, White. It has delicate spices and sweetness and has a nice level of carbonation so you don’t end up feeling like you just swallowed a packet of inflated balloons. I have a special place in my heart for witbiers as they were the first beer style I fell in love with, discovering Hoegaarden when I was working at The Belgian Beer Cafe Westende. This is, however, the first time I’ve tried cooking with it. The fruity notes from the beer added a touch of sweetness that went nicely with the pie, I think that anything sweeter would have been overpowering for the chicken, butter and veggies. Feral Whites spices and subtle tartness are great with leek, almost making it bolder than what it would be on its own. Unlike when I made the Onion, Stout and Goat’s Cheese Tart, the impact of Feral White on the outcome was subtle to the point where I doubt I would have been able to pick it if I didn’t know it was in there. I’m going to take this as an indication of balance of flavours and ingredients though whether this is accurate or not, I am not entirely sure but, what the hell, it sounds good. The end result was just lovely, a hearty dinner with a great balance of flavours. The bonus being a little creativity in the pastry, I don’t know why, but whenever I use pastry I always have to write something. Yum! 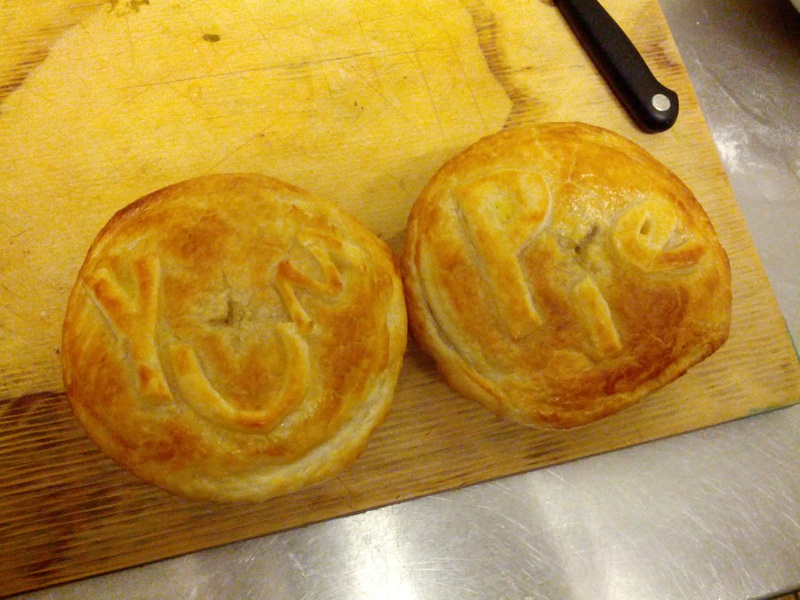 Pie! Love me some chicken and leek, and I’d probably put bacon in too – but I’m a sucker for bacon with anything (everything). Did the Sierra Nevada pale go well as an accompaniment – or was it just to assist during the cooking process? Sierra Nevada Pale Ale was a nice beer with the pie but perhaps a little overwhelming. I would have really liked to be able to get a hold of a saison for this one. Did you try Mane Liquor on Great Eastern Highway? I’ve just newly discovered it and it’s thousands of different beers. Haven’t been there in ages, had a good trip to Cellarbrations Carlisle though 🙂 lots and lots of great beer!